2 Preheat oven to 200°C/180°C fan. Line two oven trays with baking paper. a large roasting pan; season. Roast, turning occasionally, 20 minutes or until pumpkin is tender. Transfer pumpkin to a heatproof bowl; mash. Stir in herbs, spices, onion and feta; season to taste. Refrigerate until cooled. 4 Divide dough into 20 balls. Roll each ball on a floured surface into a 10cm round. Spoon 1 rounded tablespoon of the filling mixture onto half of each round; brush edge with a little egg, fold over tightly to enclose filling and form a half-moon shape. Twist the edge to seal filling (or crimp with a floured fork); place on trays. Brush tops with a little more egg. 5 Bake empanadas 30 minutes or until golden. Serve hot or at room temperature. Combine the water, yeast and sugar in a small bowl. Set aside for 5 minutes or until foamy. Combine flour and salt in a large bowl; make a well in the centre. Add yeast mixture and oil. Using your hands, mix until combined. Turn dough onto a floured surface; knead 10 minutes or until smooth and elastic. Place dough in an oiled large bowl; turn to coat in oil. Cover with cling film; set aside in a warm, draught-free place for 1 hour or until dough doubles in size. Serve with a chunky Mexican tomato salsa, if you like. You can make the filling up to a day ahead; store, covered, in the fridge until ready to use. 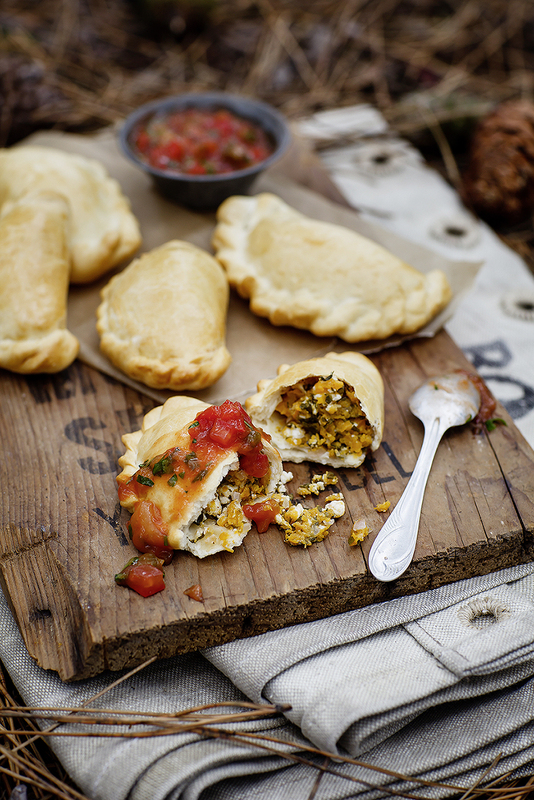 Unbaked empanadas can be frozen for up to 2 months. Bake them from frozen for 40 minutes or until golden.